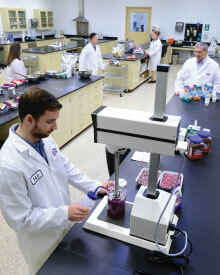 At Blue Diamond, we’re leading the industry in setting food safety and product quality standards. Our premium-quality almond products—sourced from California—reflect the industry best-practices we’ve established in harvesting, storing and processing. We’re constantly improving our operations with new technologies, updated machinery, and a new state-of-the-art processing facility that recently earned the Plant of the Year Award from Food Engineering Magazine. When you partner with Blue Diamond®, you can rest assured that you’re getting the safest, cleanest, freshest almond products available. Almonds have natural antioxidants that promote a long shelf life. In fact, they can retain their goodness longer than many other nuts and can be carried over from one year to the next by maintaining certain safeguards and controlled conditions. To prolong the shelf life of roasted products, packaging is crucial. Store or display almonds in cool, dry, odor-free conditions. Avoid prolonged exposure to direct sunlight, which tends to darken shelled almonds and decrease their stability. Avoid exposure to strong odors, as almonds can absorb the odors of other materials, chemicals, and pungent foods. Rotate to optimize shelf life. Almonds can be stored frozen, which extends the shelf life significantly; however, proper packaging must be used to protect them from ice formation and moisture. Freshness. Flavor. Aroma. Texture. At Blue Diamond, we understand what’s important to consumers. These factors play a significant role in food development and marketing. Blue Diamond Growers’ Almond Innovation Center has conducted extensive research on almond shelf life, continuously testing and monitoring hundreds of products with almond ingredients. Our data confirms that almonds have a longer shelf life in comparison to other nut meats. What causes almonds to go bad? When oxygen reacts with unsaturated fat through the autoxidation process, various breakdown products are formed, causing off-flavors and other problems, like rancidity. Our shelf-life procedures are established to help protect your almonds from going sour. What decreases almond shelf life? Size of pieces Greater surface area, greater opportunity for the autoxidation process. Moisture content Increased moisture can increase oxidative and biological processes. Exposure to light and certain metals Light’s free radical formation—and some metals—can increase oxidative processes. Processing methods Cutting, blanching, roasting, adding moisture or poor-quality roasting oil can shorten the product’s shelf life. What increases almond shelf life? Roasting methods Under normal storage conditions, dry roasted almonds can last longer than oil roasted. 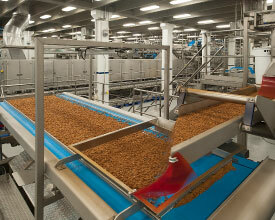 Coatings Antioxidant applications or chocolate coatings can sustain shelf life. Synthetic Antioxidants BHT is an effective synthetic antioxidant for almonds. Natural Antioxidant Mixed tocopherols, a commercial product, is an effective natural antioxidant.